Over There, this Norman Rockwell painting, appeared on the cover of Life Magazine published January 31, 1918. 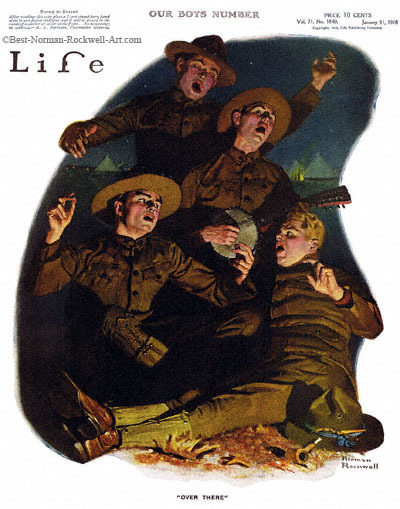 An alternate title for this picture is Soldiers Singing by the Campfire. This was the fifth cover by Rockwell to appear on Life Magazine. A Rockwell illustration appeared on the Life magazine cover ten times in 1918 and twenty-eight times in all. The first Norman Rockwell Life cover, T'aint You was published on May 10, 1917 and the last cover,Girl Scouts Number on November 6, 1924. Over There was also republished on the cover of the April 10, 1918 issue of Ocean Wireless News. Ocean Wireless News billed itself as "A Daily Newspaper For Travelers, With Theatre And Fashion Features." This issue, Volume 13, No 3, filled 32 inner pages of news. The original oil on canvas painting, 29 inches by 24 inches (76cm by 61cm), is located in a private collection. This illustration is reproduced on page 38 of Norman Rockwell, A Definitive Catalogue by Laurie Norton Moffatt and on page 14 of Norman Rockwell's Four Freedoms by Stuart Murray and James C. McCabe. This illustration also appeared in the 1915 book, The Secret Play by Ralph Henry Barbour. This particular painting also appeared later in 1918 on the cover of the sheet music for George M. Cohan's famous and well-loved song of the same name, Over There. Among his other admirable traits, Norman Rockwell was very patriotic. His subject matter during the First World War is evidence of that fact. Here we see four American soldiers, all infantrymen, in harm's way in a foreign country. The soldiers all appear to be young men. Completely separated from the tents in the background, they all appear to be having a wonderful time. These four doughboys are spending this night sitting beside a roaring fire. They are singing. One is playing a small banjo called a banjo-ukelele. We can't be absolutely certain whether they are singing Cohan's stirring patriotic song or some other favorite of the day. Either way, they certainly look animated and excited in their performance. Rockwell was a master at conveying just such complex emotions in his paintings.